Back in February we learned that Broadview TV in Cologne was producing a documentary on the Thyssens to be shown on German television (ARD channel) later this year as part of their ‘German Dynasties’ series. This was interesting news, as we knew that for several years such a venture has been planned in Germany but had so far failed to materialise.Following the publication of our book, a major rewriting of the family and corporate history was initiated, co-sponsored by the Thyssen corporation (via Fritz Thyssen Foundation) and the Thyssen family (represented by Georg Thyssen-Bornemisza). Now Broadview TV was announcing that their film (see this Scanned Document) would feature ‘August, Fritz and Heini Thyssen’, making no mention of either Heini’s father Heinrich Thyssen-Bornemisza, a key figure of the story whose role we have researched and reported extensively, or Fritz’s wife Amelie, who was a committed Nazi, yet regained ownership and control of the corporation after Fritz’s death in Argentina (not in Germany) in 1951, while never publicly recanting her political beliefs. Instead, Broadview TV announced that their emphasis would be on ‘Fritz Thyssen’s TRAGIC embroilment with the Third Reich’ as well as ‘the patron of the arts Hans Heinrich Thyssen-Bornemisza’. For a brief moment we paused to think what Heinrich and Heini Thyssen, who had spent most of their lives aggressively denying their Germanness, would think about being turned back into ‘Germans’ posthumously! And hadn’t Fritz and Amelie always insisted they were stateless? In my opinion as a German it is wrong for the German public to be asked to accept this family back into their national consciousness as one of their own, without being given the chance of seeing an unbiased picture of BOTH their achievements AND their failings. We are not in any way denying the Thyssens’ achievements. They created a vast industrial empire, thousands of jobs and careers as well as wealth for the German nation and beyond. To be more precise, August and his brother Josef did those things, as well as their workers, foremen and managers. But Fritz (& Amelie) and Heinrich Thyssen were big cogs, very big cogs indeed in the process that brought Adolf Hitler to power. As such, the Thyssens’ ‘embroilment’ with the Nazis was NOT, I repeat NOT tragic for the Thyssens. The Thyssens were not victims. They were perpetrators. They supported the Nazis because they wished to eradicate Communism and Socialism and ensure their own profits and lifestyles. The actual tragedy was the one that befell the people of Europe and of the wider world who died in their millions or survived to live on with their haunting memories. More often than not they were offered no support to come to terms with their experiences, while the Thyssens were allowed back into the position of role models. Now they’re reintroduced into the German media and, in our opinion, instead of owning up fully to their historic role, commission sanitised reports which airbrush inconvenient truths out of the public picture. This is evident in recent publications where embarrassing facts were circumvented or ignored. We decided to contact Mr Dehnhardt to try and find out what kind of course he was planning to take with his documentary. Having written to him early in February we heard nothing. 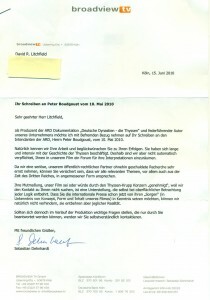 So we wrote to the Head of ARD, Mr Peter Boudgoust. 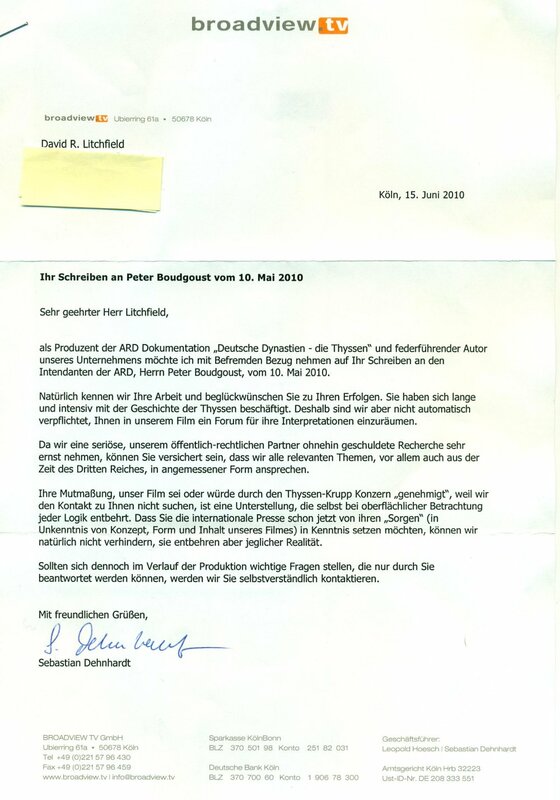 He wrote back a very nice letter, saying he had passed our concerns on to the commissioning editors, in this case Christiane Hinz at WDR in Cologne. But we heard nothing from Mrs Hinz, even when emailing and phoning her. Finally, after another letter to Mr Boudgoust, Mrs Hinz replied. She suggested our worries were ‘unfounded’, that the ‘POSSIBLE film about the Thyssens’ was still ‘ONLY AT A PROJECT STAGE’, that ‘all relevant historical points’ would be researched and that ‘if any questions arose that only [we] could answer’ they would ‘of course’ contact us. No apology was made for her previous silence. Now finally – after 4.5 months – Mr Dehnhardt too has chosen to communicate with us, though rather pointedly, he has addressed his reply (see enclosed) to David only, not to myself, his German kinswoman, although our letter came from both of us. Once again, like Mrs Hinz before him, Mr Dehnhardt points out that ‘all relevant themes, including those from the time of the Third Reich’ will be dealt with, but adds ‘you have no right to expect for the interpretations derived from your research to be given an automatic platform in our programme’. He also bemoans our sceptical approach, stating that it is ‘devoid of any reality’, particularly in view of the fact we ‘know nothing about the concept, form and content of [his] film’. Meanwhile, however, he still fails to communicate any of the concept, form and content in the professional manner that we would expect. The word ‘interpretation’, of course, is a very interesting choice in this context, as it carries all the connotations of ‘spin’. The fact is that if you leave Heinrich Thyssen-Bornemisza and Amelie Thyssen out of the picture, you refuse to deal with real historical issues, namely those of managing German companies throughout the war from a Swiss safehaven, including the use of slave labour, international Nazi banking, the Rechnitz Massacre, the Thyssens’ post-war protection from Allied retribution, etc, etc, etc. These are straightforward facts; not ‘interpretations’. 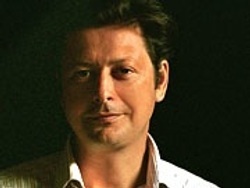 Mr Dehnhardt has been criticised in the past for producing a documentary in which the views were said to have been over-emotional and unbalanced. Kultura Online Magazin found that his film on the battle of Stalingrad did not give a voice to the Russian side and only described the results but not the reasons for the historic developments in question. When confronted with this criticism, Mr Dehnhardt replied: ‘I think the individual [German] soldier also has the right to be a victim, especially in the context of Stalingrad. My film shows that he was only a small cog in a big machine’. Here Mr Dehnhadt is right. But this statement begs the question as to how he will deal with the ‘big cogs’ when it comes to his documentary on the Thyssens. Will he still have the likes of his father (or my father and uncles for that matter) in mind or will he now bow to the power and influence of the cosmopolitan ‘big cogs’? Will he tell the German public the tale of Fritz Thyssen suffering in a concentration camp, although we established he was under comfortable, protective custody while his brother Heinrich continued to supply the Nazis with coal, submarines and aerial torpedoes from the safety of Switzerland? And will he tell people what an art expert Heini Thyssen was when we showed that Heini Thyssen himself told us his father had bought the collection simply in order to transfer money out of Germany and Thyssen art has been used and abused as a convenient veneer behind which to hide a guilty past ever since? We shall have to wait and see. But after our experiences of looking into all things Thyssen for over fourteen years, we remain sceptical, particularly since Mr Dehnhardt makes several films on different subjects every year. In this short space of time he could not possibly have enough insight into a vast topic such as Thyssen to offer anything but a simplified view. A view that is in danger of misrepresenting the past in a way that will once again allow the Thyssen big cogs to indulge their privileges while shunning their historic responsibilities. We really hope to be proved wrong, because for the last seventy plus years the German public has been misinformed regarding Thyssen. We believe that while they may not like the image of the Thyssens that we have revealed, it is up to them, not to what might prove to be a Thyssen-influenced media company, to decide. The programme was finally aired on 8 November 2010.
eldeadpixel writes: Thanks for this good article. I wonder if that documentary will be shown here in Spain… Keep us up to date!